One of my guilty pleasures is to buy hot coffee or iced tea out in the world. A dog walk is an opportunity to go by a café. Errand running, another chance to just stop by Dunkin’ Donuts. Waking up in the morning: a chance to figure out where and when I will be forced to buy a caffeinated drink. What really makes me feel guilty about it is the paper and plastic waste I am generating. The paper cup, the plastic lid, the cardboard sleeve I take, the plastic cup, the straw…. It’s all bad, even if it goes in the recycling after spending some time on the floor of my car. I hate buying a thing to solve a problem. For awhile I pretended to myself that I would cut this habit and make most of my coffee and tea at home. But I am addicted to the experience of someone else making it and of carrying it around in an adult’s sippy cup. I started looking at reusable containers. The huge plastic cold drink containers at Dunkin’s seemed even more environmentally egregious and are just plain ugly. The reusable coffee mugs have annoying (to me) handles and are either made of plastic or have a dark cavernous inside that would never get cleaned. The ceramic cup with silicon lids are gorgeous but a.) bound to get broken and b.) isn’t silicon a bad-mining thing? 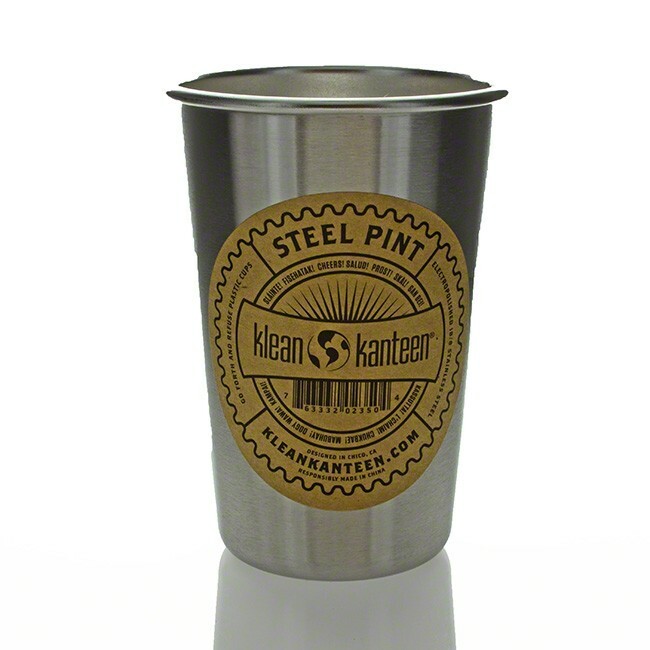 When I stopped looking, I found Kleen Kanteen’s steel pint at the grocery store, lid sold separately. The steel conveys that industrial chic while camping thing. The lid contains a small amount of silicon and of course hard plastic. The entire thing is “responsibly sourced” which means, at least, somebody thought about whether it created emissions or eroded mountain gorilla habitat or some other bad something. It was expensive. Ten dollars for the cup and seven for the lid (as if you would buy a sippy cup without a lid). We laughed about that. Then I bought it anyway.